On 6 February 1952, at the age of 25, Princess Elizabeth became Queen on the death of her father, King George VI. 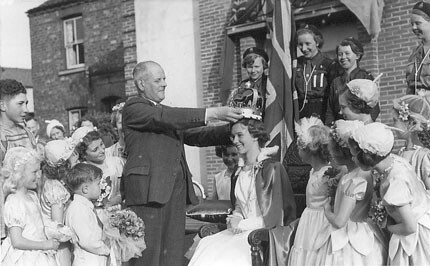 One year later, residents of Bishopthorpe started planning to celebrate the Coronation which was to be held on 2 June 1953. When June arrived, the villagers started a party that lasted a whole week! 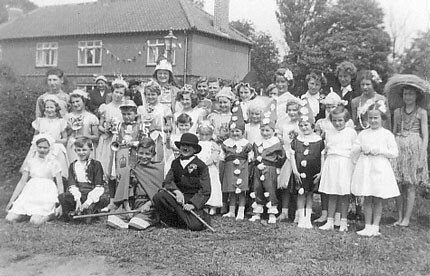 They held sports events, firework displays, dances, fancy dress parades and crowned their own Carnival Queen. “I was about eight years old and feeling very proud of myself. I had been chosen to represent my home village in the Coronation Festivities. There had been a lot of preparations going on for many months. I had been for an ‘interview’ in the village hall where any children who were interested in taking part had to parade on stage in front of the Committee. It was a thrill to have been chosen. “We then attended fittings for our costumes which had been cut out by the Village Seamstress, Phyllis Trafford. The costumes were finished by our mothers on their Singer sewing machines. 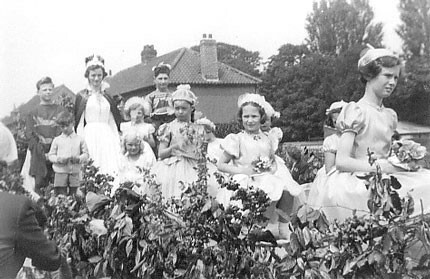 1 June 1953: Surrounded by flower fairies, Mr. Reading crowns Carnival Queen Janet Heath outside the village hall. “The Carnival Queen was Janet Heath. She had a magnificent dress with a red train – I was one of her attendants. We were Flower Fairies, all dressed in different pastel colours. I was a Violet and my dress had a full net skirt with scalloped petals around the waist. We wore little caps with stalks on top and carried a posy of appropriate flowers to match. 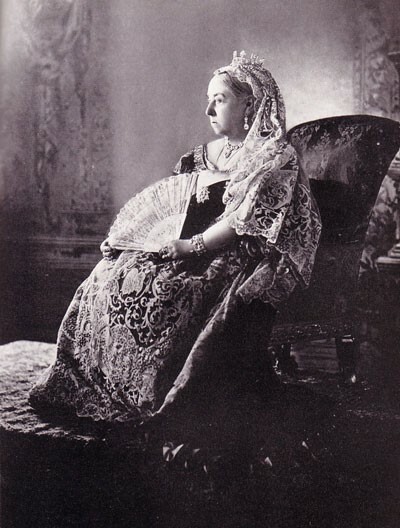 “Eve Simpson was the Queen’s Special Attendant; dressed in white. She carried a cushion upon which the crown was placed until the Crowning Ceremony. We gathered outside the village hall for photographs, with a Guard of Honour. “We climbed on to a flat-bed lorry, which was decked out with bunting and Union Jacks, and transported to the celebrations in the field in Acaster Lane (where the shops now are, opposite the Cricket Field). With thanks to Elizabeth Hulme (nee Anfield) for her memories and Barbara Duggan (nee Judson) for her photographs.